Thought this might be a nice out-of-season shot to share, on yet another snowy day in my neck of the woods (and maybe yours, too). Rick offers us a pic from Mercer County, Pennsylvania, near the hamlet of Jackson Center, an hour north of Pittsburgh. There are at present 3 Amish settlements in Mercer County, the oldest and largest settled in 1942, and having 5 church districts. Later settlements came about in 1990 and 2006 and have 2 and 1 district apiece. Rick describes the homes of Amish in Lancaster County as “mansions” compared to those of the Amish living across the state in this settlement. “They are lucky to have a respectable coat of paint on the house and barn,” he notes. It’s a little unclear just which of the three groups this shot belongs too. 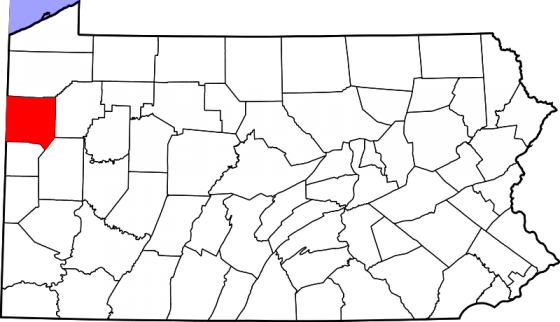 The fairly large New Wilmington community does indeed straddle the county line and exists in both Lawrence and Mercer Counties, though a good bit further to the north than Jackson Center. Or, possibly at least one of the 3 Mercer County-listed communities may be a New Wilmington spin-off. Pennsylvania currently lists 54 settlements, the highest total of any state, and Amish here as in other states frequently form new communities, such as the Big Valley daughter settlement of Renno Amish at Sinking Valley. Since 2000, at least 7 new settlements have been formed in Pennsylvania, which currently has the second-highest overall Amish population. The pic is Jackson Center, which is the 1942 settlement, according to Scott’s book “Plain Buggies”. I will probably retract my statement about New Wilmington-style buggies in this area – I wasn’t as schmart when I said that as I am now! Without looking at the book, I recall the pictured buggies being described as “Geauga style”, as in Geauga County, Ohio. I do know the book says that Jackson Center was a 1942 spin-off of the Atlantic, PA settlement, and Atlantic was formed in 1924 from the Amish of Geauga County. Regarding the Mercer County settlements. Interstate 80 runs east to west thru Mercer County. Below I-80 and just a few farms immediately north on the other side of I-80 is the New Wilmington (Lawrence County) settlement. Jackson Center is north of I-80 and a little to the east of I-79. The rest of this settlement is west of I-79 in the Fredonia and Greenville area. North into Crawford County the Atlantic area settlement and to the west the Spartansburg area settlements are Old Order while the Conneatville and the Guys Mills settlements are New Order. I am pretty sure all of them have black buggies except New Wilmington. 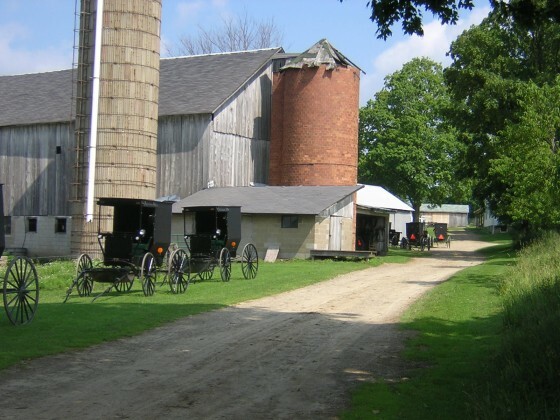 The photo is from Jackson Center, I’ve been past this farm before. Nice photo, Rick! Correction: Spatansburg is to the east. Bill, Rick, thanks for jumping in and polishing the details on this post up for me. You guys give me a break every now and then and I appreciate it!! Beth, you know I’ve only driven through a Missouri settlement on the way from an Iowa settlement, and did not spend any time there. You’re right, Jamesport and Seymour are the big ones in MO along with Clark. Would enjoy another trip to the Show Me state sometime, I actually lived there for two summers while selling books, down in the bootheel, and in Camdentown by Lake of the Ozarks. But did not visit any Amish communities then. And I thought the same about the pic. The sun surprised everyone and came out today here, though, giving a needed reminder that the world actually will look green again, right? I live in N.J. but long for the Communities of the Amish. Is there any way to meet and make friends with the Amish being a common person. I would love to work and mingle with the Amish for a weekend at no expense to them just for the pleasure of being in there company. If someone could help me with this please drop me a line. Hi Tim, it’s definitely possible to meet and make friends with an Amish person as Amish people do enjoy friendships with non-Amish people. The best advice I could give would probably be to make an effort to meet some Amish people in person. It might help to have a basic understanding of Amish beliefs beforehand as well, by reading about them in books or online sources. There are other people on this blog that have experience and may have ideas as well. Thanks for reading by the way! On another note – I live near a settlement of Old Order Amish, which is in Forest County, PA – Most around my area call them “The Lake Lucy Amish”, for the fact that they live in a area called Lake Lucy, or Wolfs Corners, near Leeper, PA and Tionesta, PA.
A Amish family I’ve come to be very good friends with, watches my children when something comes up. My daughter is very good friends with one of their daughters, they are the same age. We visit them during the week, sometimes on Saturday, and my husband and I often can be found taking a buggy ride to the local auction with them. Wonderful Christians they are. It took them awhile for them to warm up to us, but over the years, we have become VERY close, and we have learned so much from them – not just about their faith, but everything in between. Just thought I’d put my two cents in! Thanks! Thanks for sharing Joy, sounds like a wonderful example of friendship. I liked your comment for a couple of geographical reasons too–the term “Lake Lucy Amish” I hadn’t heard, though I did once spend some time in a different Leeper–tiny Leeper, MO. I returned from a trip to Meadville, PA and visited The Windy Knoll Grocery in Sandy Lake. The Amish women who run the store were so warm and friendly. I have never experienced customer service like this before. What group of Amish are they? I assume Old Order. Thank you.